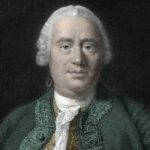 David Hume was a Scottish philosopher, historian, economist, and essayist, who is best known today for his highly influential system of philosophical empiricism, skepticism, and naturalism. Hume’s empiricist approach to philosophy places him with John Locke, Francis Bacon and Thomas Hobbes as a British Empiricist. Beginning with his A Treatise of Human Nature (1739), Hume strove to create a total naturalistic science of man that examined the psychological basis of human nature. "A purpose, an intention, a design, strikes everywhere even the careless, the most stupid thinker." "The heights of popularity and patriotism are still the beaten road to power and tyranny." "Nothing endears so much a friend as sorrow for his death. The pleasure of his company has not so powerful an influence." "There is a very remarkable inclination in human nature to bestow on external objects the same emotions which it observes in itself, and to find every where those ideas which are most present to it." "Heaven and hell suppose two distinct species of men, the good and the bad. But the greatest part of mankind float betwixt vice and virtue." "The law always limits every power it gives." "The Christian religion not only was at first attended with miracles, but even at this day cannot be believed by any reasonable person without one."